ROSELAND, NJ--(Marketwire - April 30, 2008) - According to today's ADP National Employment Report (SM), private sector employment increased by 10,000 in April. The ADP National Employment Report, created by ADP® Employer Services, a division of Automatic Data Processing, Inc. (ADP), in partnership with Macroeconomic Advisers, LLC, is based on actual payroll data and measures the change in total nonfarm private employment each month. According to Joel Prakken, Chairman of Macroeconomic Advisers, LLC, "Nonfarm private employment increased 10,000 from March to April 2008 on a seasonally adjusted basis, according to the ADP National Employment Report. The estimated change in employment from February to March was revised down from an increase of 8,000 to an increase of 3,000." "Though April's estimate for a small increase in employment is above consensus forecasts of an outright decline, it nevertheless suggests that a sharp deceleration of employment continues." Prakken added, "Employment in the service-providing sector of the economy grew 64,000, while employment in the goods-producing sector declined 54,000, the seventeenth consecutive monthly decline. Manufacturing employment fell 26,000 in April and marked the twentieth consecutive monthly decline." "Large businesses, defined as those with 500 or more workers, saw employment decline 18,000, while medium-size companies with between 50 and 499 workers declined by 14,000. Conversely, employment among small-size businesses, defined as those with fewer than 50 workers, advanced 42,000 during the month," said Prakken. Prakken went on to say, "Two sectors of the economy hit hardest by recent problems in mortgage markets have been residential construction and financial activities related to home sales and mortgage lending. In April, construction employment fell another 28,000. This is the seventeenth consecutive monthly decline, bringing the total decline in construction jobs since the peak in August 2006 to 288,000. Employment in the financial activities sector advanced just 2,000 for the month." The matched sample used to develop the ADP National Employment Report was derived from ADP data which, during the last six months of 2007, averaged approximately 392,000 payrolls representing nearly 24 million U.S. employees. This approximately represents the size of the matched sample used this month. Due to the important contribution small businesses make to economic growth, employment data that is specific to businesses with fewer than 50 employees will be reported in the ADP Small Business Report (SM) each month. 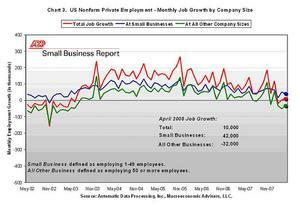 The ADP Small Business Report is a subset of the ADP National Employment Report. Private employment among small businesses increased by 42,000 in April, according to the ADP Small Business Report released today. Additional information about small business employment, including charts on monthly job growth and employment levels, along with historical data, is available at http://www.smallbusinessreport.adp.com. "Employment among small-size businesses, defined as those with fewer than 50 workers, advanced 42,000 during April, down from a revised 53,000 increase in March. This moderate growth of employment among small-size businesses contrasts with employment declines among larger firms, and is consistent with the stronger growth and resiliency these businesses have demonstrated over the past several years," said Joel Prakken. To obtain additional information about the ADP National Employment Report, including additional charts, supporting data and the schedule of future release dates, or to subscribe to the monthly e-mail alerts and RSS feeds, please visit www.ADPemploymentreport.com. The May 2008 ADP National Employment Report will be released on Wednesday, June 4, 2008 at 8:15 a.m. ET. 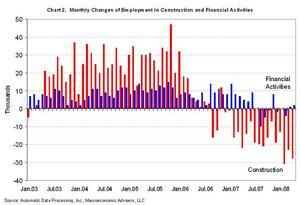 The ADP National Employment Report, sponsored by ADP®, was developed and is maintained by Macroeconomic Advisers, LLC. It is a measure of employment derived from an anonymous subset of roughly 500,000 U.S. business clients. During the last six months of 2007, this subset represented approximately 392,000 U.S. business clients and nearly 24 million U.S. employees working in all private industrial sectors. The ADP Small Business Report (SM) is a monthly estimate of private nonfarm employment among companies in the United States with 1-49 employees and is a subset of the ADP National Employment Report. The data for both reports is collected for pay periods that can be interpolated to include the week of the 12th of each month, and processed with statistical methodologies similar to those used by the U.S. Bureau of Labor Statistics to compute employment from its monthly survey of establishments. Due to this processing, this subset is modified to make it indicative of national employment levels; therefore, the resulting employment changes computed for the ADP National Employment Report are not representative of changes in ADP's total base of U.S. business clients. Empirical analysis performed by Macroeconomic Advisers suggests that the ADP National Employment Report can be used to develop a forecast of "true" employment that is superior to those resulting from consensus estimates, survey data, or other models of employment that do not incorporate the results of the ADP Report. For a description of the underlying data and the statistical properties of the series, please see "ADP National Employment Report: Development Methodology" at http://ADPemployment report.com/methodology.aspx. Automatic Data Processing, Inc. (NYSE: ADP), with nearly $8 billion in revenues and over 600,000 clients, is one of the world's largest providers of business outsourcing solutions. Leveraging more than 55 years of experience, ADP offers the widest range of HR, payroll, tax and benefits administration solutions from a single source. ADP's easy-to-use solutions for employers provide superior value to companies of all types and sizes. ADP is also a leading provider of integrated computing solutions to auto, truck, motorcycle, marine and recreational vehicle dealers throughout the world. For more information about ADP or to contact a local ADP sales office, reach us at 1.800.225.5237 or visit the company's Web site at www.ADP.com. Macroeconomic Advisers, LLC (MA) has been the most trusted source for U.S. macroeconomic forecasts and commentary, monetary and fiscal policy analysis, and econometric modeling for 25 years. MA's clients include leading financial service firms, nonfinancial corporations, key policymaking agencies of the U.S. government, as well as State and Foreign Government agencies. Additional information on Macroeconomic Advisers, LLC is available on the company's Web site, www.MacroAdvisers.com.